GuitarControl.com released a new video guitar lesson from GuitarControl.com instructor and creator Claude Johnson. 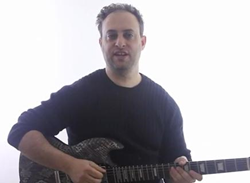 In this guitar lesson, now available on YouTube.com, Claude Johnson teaches a blues pentatonic lick in the key of A flat. “Today’s lick is in A flat pentatonic”, says Johnson, “but its up on the octave”. Claude is talking about the release of GuitarControl.com’s new easy blues video lesson now available on YouTube. This video is another of many free video lessons put out by GuitarControl.com that are sure to help anyone improve on the guitar. Johnson does a great job of breaking the lick down so that it is easy to follow along with, no matter your skill level. The lick starts out with a three note per string minor pentatonic sequence of a four note pattern and then shifts up to another position of the scale and descends with another four note pattern. “Check out my course Supercharged Soloing Made Simple for more three note per string licks”, says Johnson. Guitar TAB’s are available for this easy blues lead guitar lesson at GuitarControl.com.